WWE Hall of Fame is held every year just a night before WrestleMania 35. 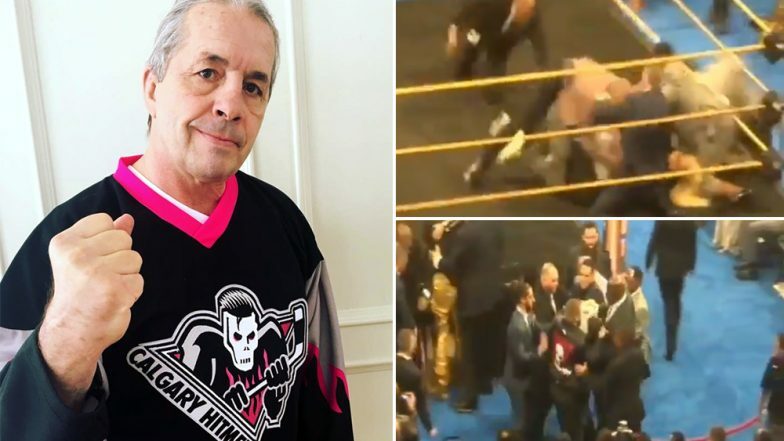 On April 6, 2019, a disgusting act was attempted by a spectator where he tackled the legendary wrestler Bret Hart during his induction speech. WrestleMania 35 Results and Highlights: Becky Lynch, Kofi Kingston and Seth Rollins Become New Faces for Championship Title (Watch Video). Bret Hart is a Canadian-American retired professional wrestler. Hart has held championships in five decades from the 1970s to the 2010s, with a total of 32 held throughout his career, and 17 held between the WWF/WWE and WCW. Bret 'The Hitman' Hart was present alongside her niece Natalya, who is also a WWE superstar. The female WWE star Natalya is the daughter of Jim "The Anvil" Neidhart, who was being inducted along with Bret Hart. Bret Hart is the brother-in-law of Jim Neidhart. Bret was honouring his brother-in-law, Jim "The Anvil" Neidhart and the tag team the two had formed in the mid-1980s, which was being inducted into the WWE Hall of Fame Saturday night. The 26 years old Zachary Madsen is the spectator who attacked Bret Hart during his speech. According to the New York Police Department (NYPD), Madsen jumped into the ring and grabbed 61 years old Hart. Bret Hart and Natalya continued their speech after the spectator was taken into custody by the police.